The Tubby slope is situated at Gardonè: near the Predazzo-Gardonè bubble car. 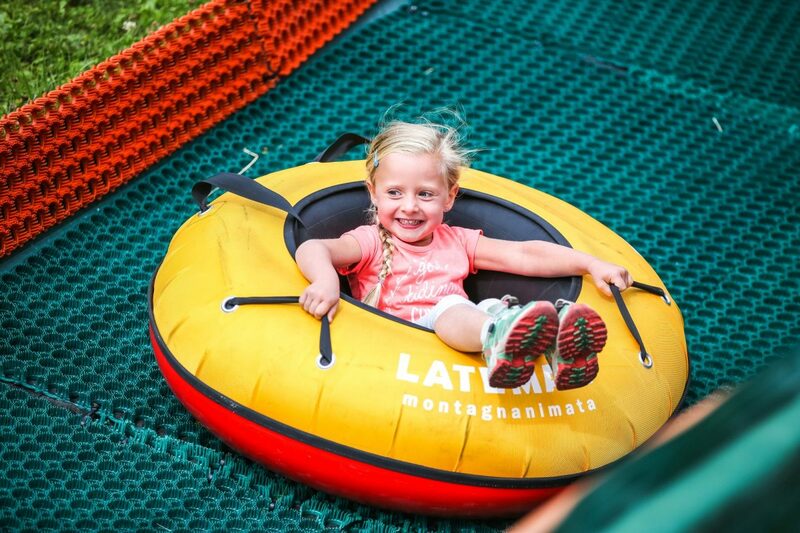 Take a rubber ring and step onto the magic carpet which will take you to the top of the slope. 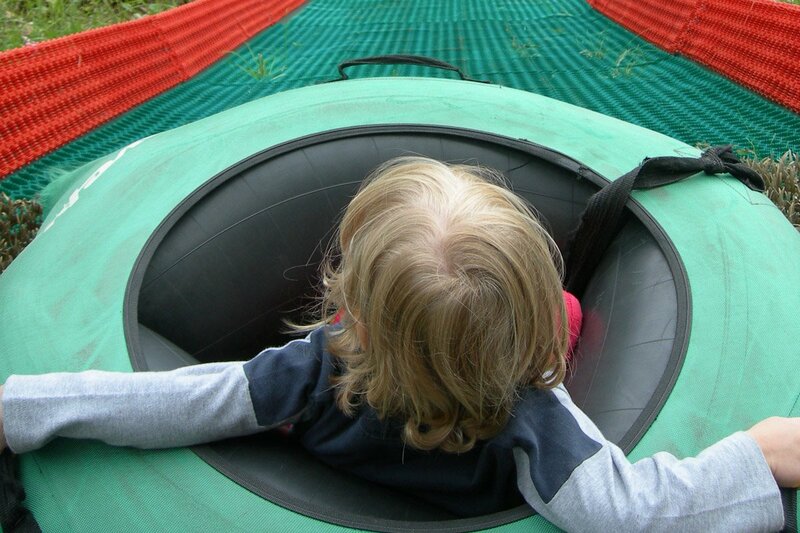 Sit down on the rubber ring grip the handles tightly and go, everybody sitting on their own ring. At the start, behind the little wooden house, there is an assistant who will help you get comfortable on the ring and take your run-up. 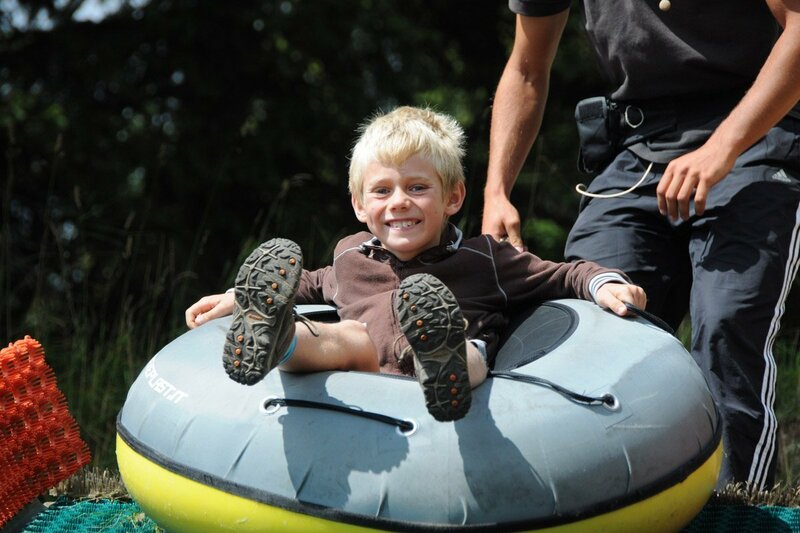 There is no age limit, it is suitable for kids and adults. 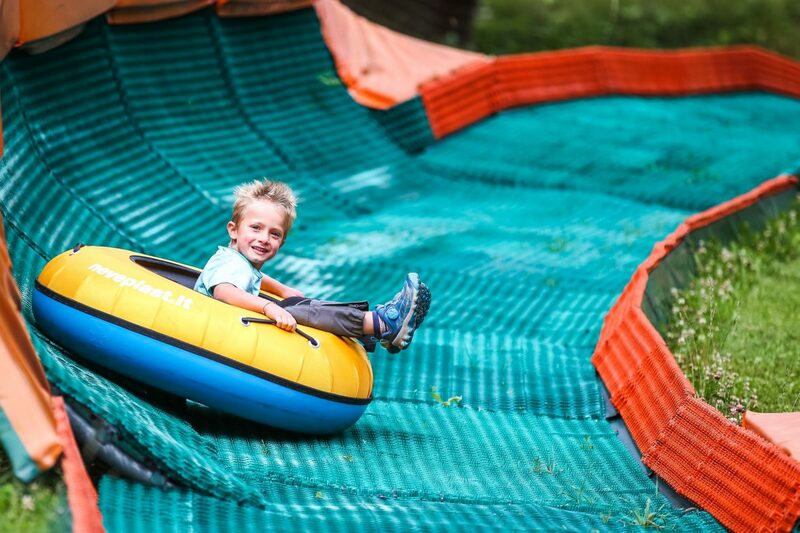 The Tubby slope is ideal for children and families. Adults can give it a go or choose to enjoy the show from the bottom. You are at 1650 m of altitude, in the mountains, at Gardonè: only 15 minuts from Predazzo, in Val di Fiemme, on the Trentino Dolomites, UNESCO Heritage. All activities stop with bad weather and rain and start again when the rain stops. 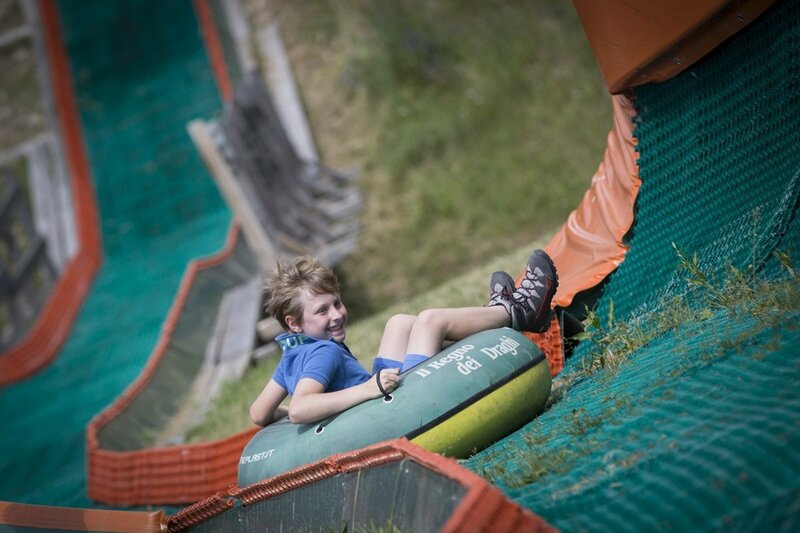 There is a strategic point which families love: just under the Tubby Slope. From there you can see the children smile as they shoot down, the photos are perfect. Some people lay a rug out in the sun, and enjoy the break, chatting to friends while keeping an eye on the children. Where are they? They’ve just done a ride on the Tubby slope, grabbing their ring, and are heading back to the top and are ready for another ride: they are playing. The best part is half way down. Depending on their weight, their run-up and how they approach the parabolic turn you speed down at high speed. Great fun even for the younger children. 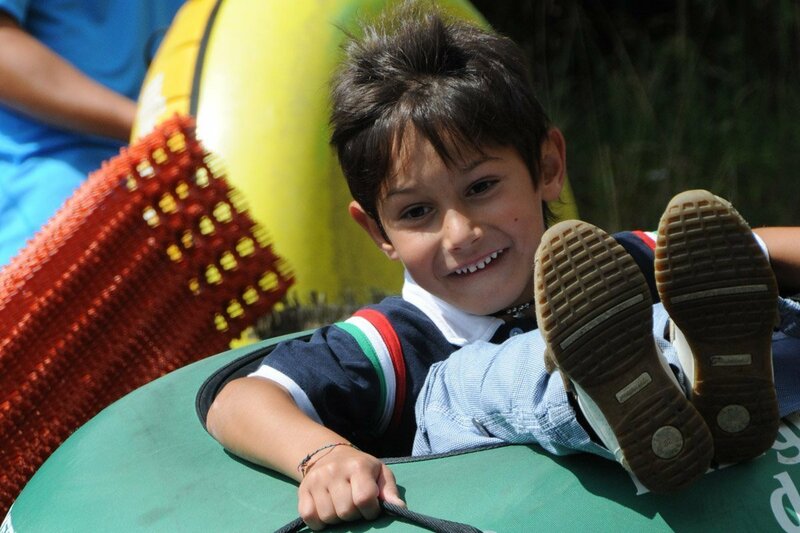 You will see the older kids running towards the Alpine Coaster Gardonè. Everything is nearby, you can keep an eye on everyone while you enjoy the sunshine. Sign up for our newsletter and get all the latest updates from MontagnAnimata!!! Information notice pursuant to article 13 of the GDPR 2016/679.